Was the Ark of the Covenant an Electrical Capacitor? You have a sense that is termed echolocation. That uses phonons in the same way that vision uses photons. There was a time when people were complaining about the ringing in their ears and the doctors unsure of the cause gave them meds for it and sent them home. Vision + Echolocation = Proprioreception. I wonder if Joshua used phonons to bring down the walls of Jericho... Would the gold and wood of the Ark have created a natural electrical charge capacitor or something? They could have built up a huge static charge in the Ark somehow (after all the Arc was deadly to those who were not priests and initiated into the mystery). The mystery of being safe with the Ark probably related to the priests ensuring they were properly insulated and safe from the potentially dangerous high voltage discharges. At the beginning of his reign, King David removed the Ark from Kirjath-jearim amid great rejoicing. On the way to Zion, Uzzah, one of the drivers of the cart that the Ark was carried on, put out his hand to steady the Ark, and was struck dead by God for touching it. Large voltages can be built up by simple manual electro static processes which have been known to mankind since the dawn of history.... but the creation of an actual electrical capacitor at the dawn of human civilisation is really a rather remakable feat. Also the Ark was apparently used to communicate directly with God, again, was this possibly also connected to some kind of mystical electrical process? The ark served (i) as receptacle for the two tablets of the Decalogue (Ex. 25:16, 21; 40:20; Dt. 10:1-5) and also for the pot of manna and Aaron’s rod (Heb. 9:4-5); (ii) as the meeting-place in the inner sanctuary where the Lord revealed his will to his servants (Moses: Ex. 25:22; 30:36; Aaron: Lv. 16:2; Joshua: Jos. 7:6). Thus it served as the symbol of the divine presence guiding his people. The ark was made at Sinai by Bezalel to the pattern given to Moses (Ex. 25:8ff.). It was used as a depository for the written law (Dt. 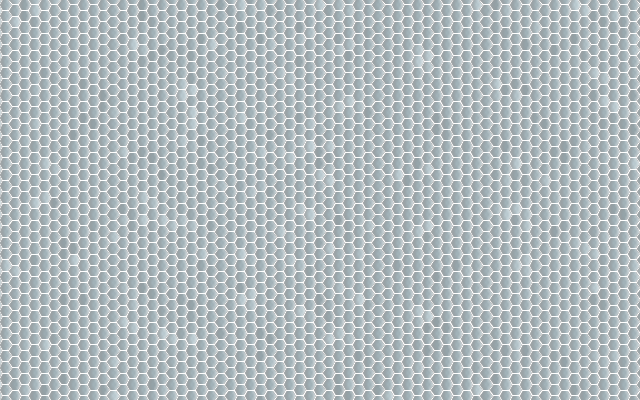 31:9; Jos. 24:26) and played a significant part at the crossing of Jordan (Jos. 3-4), the fall of Jericho (Jos. 6) and the ceremony of remembering the covenant at Mt Ebal (Jos. 8:30ff.). Here's something interesting, apparently the theory that the Ark was a capacitor goes back to 1933. Among the many lessons to be found in the Bible, prominent among them is "Look, but don't touch." When an Israelite named Uzzah laid hands upon the Ark of The Covenant, he was struck down by God. But, in 1933, an engineering professor theorized that the real cause of death was 10,000 volts of static electricity. The scientiﬁc interest in the construction pointed out by Prof. Rogers was that the acacia wood box—about 40 inches long and slightly less than 30 inches in width and in depth—not only was lined with gold teal on the inside but overlaid with the some metal without. This, according to Prof. Rogers, is the first step that any modern boy with a ﬂare for electrical experimentation will take to create a Leyden jar, except that in the Leyden jar, a glass receptacle is coated on the inside and outside with tin foil instead of gold. Then, with the aid of a rod with a small knob at the top and a short chain at the bottom which is inserted through the cork so that the chain can make contact with the bottom of the jar, the young experimenter is ready to collect small charges of bottled lighting. 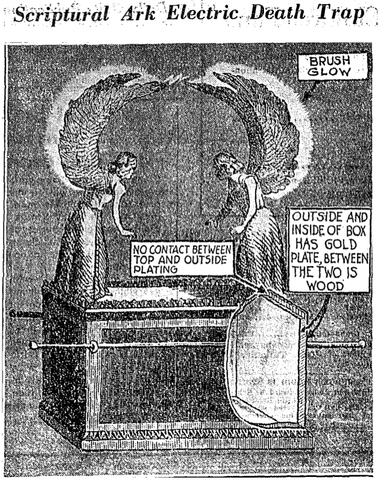 But the Ark of the Covenant was a much larger condenser….The divine directions called for the creation of two cherubim of pure gold to be placed on a gold slab or "mercy seat" overtop the Ark. These cherubim, Prof. Rogers explained, made up what he believes to have been the positive pole of the circuit. He explained…that it is known among physicists that a "difference of potential" exists between the earth and the air which may be collected in electrical charges under certain favorable conditions…It was explained that even slight movements of heat rising in smoke—such as from burning sacrifices or even incense—would distribute lesser charges of static electricity….This, Prof. Rogers explained, may have accounted for the collecting of bolts powerful enough to cause death. The question of whether it was sufficient to melt Nazi's faces was not addressed. Absolutely! The Ark was an electrical capacitor! About the two tablets of the Decalogue. They were said two be thin sheets of Sapphire. Sapphire is also used in the breastplate of the High Priest which was a protective covering. 1. That in the description of the high priest's breastplate, Exo_39:8, et seq., the Urim and Thummim are not mentioned, but only the rows of stones; and on the contrary, in Lev_8:8, the Urim and Thummim are expressly mentioned, but not a word is said of the four rows of stones. In Leviticus from 8:7 on, Moses had to wear a gold helmet, gold plates, and he had to coat everything with oil seven times inside the Tabernacle. Before Aaron and his sons led him in they had to wash him and dress him in a shirt, pants, and a belt, and a robe. Then they had to put the protective armor on him. A primitive root; properly to plait or interpenetrate, that is, (literally) to weave or (generally) to fabricate; figuratively to plot or contrive (usually in a malicious sense); hence (from the mental effort) to think, regard, value, compute: - (make) account (of), conceive, consider, count, cunning (man, work, workman), devise, esteem, find out, forecast, hold, imagine, impute, invent, be like, mean, purpose, reckon (-ing be made), regard, think. But, the curious thing about the Decalogue is the decalogue that was put in the Ark is not the original. Maybe that is why they reduced the commands to 10 instead of 236 or whatever. Exo_32:19 And it came to pass, as soon as he came nigh unto the camp, that he saw the calf, and the dancing: and Moses' anger waxed hot, and he cast the tables out of his hands, and brake them beneath the mount. Exo 34:4 And he hewed two tables of stone like unto the first; and Moses rose up early in the morning, and went up unto mount Sinai, as the LORD had commanded him, and took in his hand the two tables of stone. Eze 28:13 Thou hast been in Eden the garden of God; every precious stone was thy covering, the sardius, topaz, and the diamond, the beryl, the onyx, and the jasper, the sapphire, the emerald, and the carbuncle, and gold: the workmanship of thy tabrets and of thy pipes was prepared in thee in the day that thou wast created. You have to consider what causes the brain to fire; what causes it to think and to dream. Seems to be an electro-magnetic field which vibrates at different states. So called Alpha brain waves and Theta (subliminal consciousness) brainwaves (EM waves) are just brainwaves of different frequency, however when asleep the brain registers a hugely reduced level of EM wave activity, in fact it is undetectable and there is no scientific framework to define what kind of brain waves are 'dreaming brain waves'. They seem to have stopped at being able to measure Theta waves which represent dazing semi-consciousness and is measurable only in so far as the subject is partially conscious. In fact the brain isn't doing anything during unconsciousness because the EM mind has already departed the body. I understand that everything creates waves of some sort either in their movement or as their constituent wave. But, the brain itself operates in negatives. Like a negative of a photograph. In photography, you do not know what all is on the photo until you process the image. I would say it is the same with thought. God says that 'Before you think of it I know it.' Something like that, but you actually know what you know before you actually know it. And that is the world that is the real world, not the physical world. The physical world, the created world is the afterimage of the holographic world. Wow. That's a great way of putting it.